Every bride wants to look stunning and become the center of attention in the wedding ceremony on her big day. Then how to make yourself stand out among the sea of ladies wearing nice dresses really needs pondering carefully. Not to mention the plump girls. Thinker even harder. It is not exaggerated to say that slim figure now is considered as the most desirable body style almost all over the world, which I totally disagree... Look at the slender wedding dress model, I’ve been worrying for a long time that is there a right wedding dress for me? Of course! My girls, today I’m gonna give you some advice in choosing the right bridal gown. A little bit plump? So what! 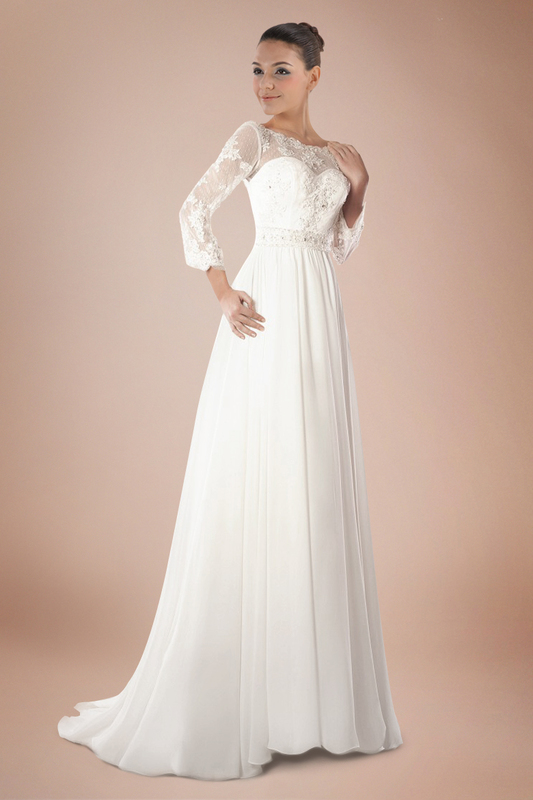 Fantastic wedding dresses are not exclusive for the slender! 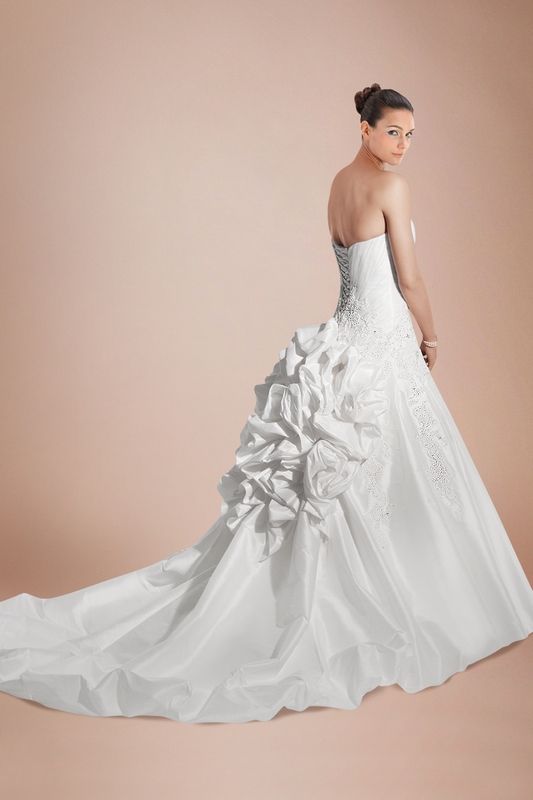 If you eager to find the perfect wedding dress for your figure, then you’re suggested to try out A-line dresses. This dress style flatters a complete figure by creating a slender curve. It is ideal for the bride who is plump and wants to hide unwanted fats. Originally designed for the bottom heavy women, the A-line dress is usually fitted in the neckline towards the hips and then flaring gently down toward the bottom, resembling a letter A. This accentuates the slimmer torso and softens the hips, giving a pleasant silhouette. What about the top heavy body shape? It’s A-line style again! Due to the firm structure and classic look of A-line dresses, a little alteration or enhancement will certainly complement it. You have several ways to apply you dream dress to your body shape. You can alter it by adding embellishments and accessories for more charming effect. Alterations can be done at the neckline, bodice, or the hem. It’s up to you. Top heavy style looks great with a well-fitted and plain bustier. So avoid frills and ruches at the bodice. The wedding dress with sleeves is another saver for plump brides having fat upper arms and fleshy armpit. And also, a wide variety of embellishments could adorn the skirt such as appliques, beadings, lace, sashes, ribbons, and prints. The appropriate accessories can also be icing on the cake, such as an elegant piece of jewelry or a nice pair of wedding shoes. The fabric of the wedding dress counts a lot because every kind of material has its own advantages and disadvantages which play important roles in the entire effect of the whole dress. Satin is the best choice for plump brides. It does well in hiding the extra fat and building up sculpt image. Take a really close and careful look at yourself in the mirror when you are trying on your dream wedding gown. What kind of look you are going to have on your big day totally depends on you! Do not expect to encounter the very right dress for the first try. Bring a tailor or just do it yourself and never give up a favorite dress easily just due to its long sleeves or unsuitable hem.